Taro and Sugarlady Chicken in ankake sauce. Makes a great dinner side dish. Product totals 90g (5 to 7 pieces). Soboro ankake is a type of relatively thick traditional Japanese sauce. This item is made with bite-sized pieces of taro, cooked with ground Sugar Chicken and seasonings. 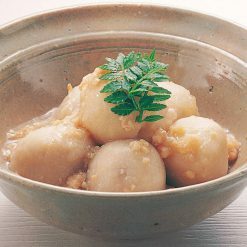 Kudzu starch is used to thicken the sauce. As it cooks, the taro is thoroughly infused with the umami from the chicken meat. Sugarlady Chicken is Sugarlady’s own chicken, which is raised with no therapeutic chemicals or antibiotics. The chickens are Akadori variety chickens, and consume feed which does not contain hormones or genetically modified crops. Taro is a somewhat sweet root vegetable frequently used in Japanese cooking, and contains vitamin E, potassium, magnesium, and fiber. Many similar commercially available items use chemical seasonings, and many are thickened using potato starch rather than kudzu starch. Without defrosting the taro, use scissors to make a cut in the end of the bag for air to escape; then place in the microwave.Approximate cooking times: 3 minutes 30 seconds in a 500W microwave, or 3 minutes in a 600W microwave.Because these this item comes seasoned and takes only moments to prepare, it makes a great midday snack. Sugarlady’s frozen appetizers are also handy for days when you’re short on time and looking to whip up a little something extra to add to lunch or dinner. 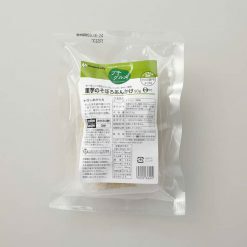 This product contains organic taro (China), chicken meat (domestic), hon-mirin, soy sauce (contains wheat), sugar, kudzu starch, flavor (katsuobushi, kombu seaweed).. Origin of ingredients: taro (China), chicken (domestic). Prepared and packaged in Japan.